Your hosts, John & MarySue Brooks, invite you to stay in their peaceful, cozy, studio apartment on their secluded 1-acre property, 20 minutes north of downtown Seattle and 5 minutes west of Mill Creek. With convenient freeway access, you can be at the beach within 20 minutes. You are also 20 minutes from 2 popular ferry routes on Puget Sound and a 90-minute drive to the North Cascades Highway, Mt. Rainier or the Anacortes ferry to Victoria, BC. You can also enjoy many wonderful restaurants, theaters and museums in the Seattle area, and you are only 10 minutes from Alderwood Mall which has all the shopping anyone could want. And after a fun day, you can relax and enjoy the peace and quiet of your own space with a separate entrance, our beautiful grounds, and lovely courtyard. Please note: We do not rent to anyone under 21 years of age; sorry, but no pets allowed. Maximum stay 30 days. We have lived in the Greater Seattle area for over 30 years, and both of us raised our families here. MarySue grew up in the Seattle area and John grew up in New York and relocated in 1973. John is a Management Consultant and MarySue manages our two vacation rentals in addition to handling all of the bookkeeping and being a Mom and Grandma. We love this area with its mountains and water views and recreational activities. We lived in a small house in the area and weren't planning to move for awhile, but when we drove up the winding, tree-lined drive to this beautiful tudor-style house on a park-like acre, we fell in love with it. At first we only used the studio apartment over the garage for family and guest visits, and after experiencing the benefits of VRBO on a trip to Hawaii, we decided to list it and have been very glad we made that decision. 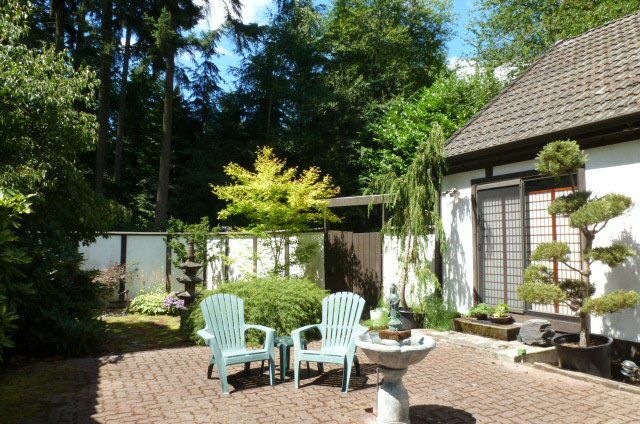 Our property has the benefit of being secluded and peaceful while being convenient to Seattle, the Cascade Mountains, and island destinations on Puget Sound. A little haven north of Seattle! Beautiful property with lots of trees and nicely tended landscaping. Carriage house has everything you need in a space that feels homey and peaceful. It was perfect location for my stay which included visiting family and friends both north and south. Quiet and comfortable! Very friendly host, made sure we were comfortable and settled and then just made himself scarce. Well equipped kitchen with range micro, toaster, electric mixer, coffee maker, larger than dorm room referigerator. You can actually cook a full meal here (we were visiting relatives so didn't need to). Will difinately return if need arrises. This has been one of my several stays here and I have enjoyed it every bit as much as the first time. My purpose has been oriented around productive business so my needs at the end of a demanding day for peace and quiet, cleanliness and order, and finally a great night's sleep are imparative. These graciously have all easily been fulfilled with each visit. Also, there's more than meets the eye for those who wish to see. Here is an unmistakable intention of warmth, kindness, and generosity which is difficult to measure but gratefully appreciated. I hope the calendar is open for when I need to return, but I wouldn't be surprised if it isn't. Beautiful secluded location, we admired the beauty of the house and garden. Simple and easy, we had all we needed to have a relaxing easy going stay. Only about 20 min out of the city. And just a couple minutes away from the mall. Very happy we had the chance to stay at the guest house. Thank you Mary! GREAT spot for a "time out!" The Seattle Woodland Retreat Guest House was very comfortable and private. I enjoyed it tremendously. It had all the comforts of home. I really enjoyed my stay. If and when I am back in the area, I’d look forward to staying again! Only 15-20 minutes from Woodinville wine country, home to over 100 Washington winery tasting rooms! We also accept personal checks and require payment of the full amount up front if the reservation is within 21 days of the date of arrival.